If your looking to add some flavor to your moonshine then you’ll definitely want to try this Jolly Rancher moonshine recipe. It’s super easy to make and everyone I know love’s it. Time to make under 5 minuets. I’ve posted materials and step by step instructions below. Step 1 : Remove wrappers and separate all the colors into individual piles. Step 2 : Dissolve Jolly Ranchers – Place 15 Jolly Ranchers of the same color in a small sauce pan and add just enough water to dissolve candy when heated. Place on stove and turn heat on low. The goal is to dissolve the Jolly Ranchers into a syrup. ( Feel free to add more or less depending on the flavor intensity you want.) Once dissolved pour into mason jar. Repeat this for each flavor. You should have five different jars each with a unique flavors in it now. Step 3: Pour in the moonshine or substitute into each jar. Fill to the bottom ring on the jars. Step 4 : Place lids on Jars give it a good shake and your ready to drink. Like any infusion I always find things get better with time. So let it age a few weeks before drinking if you have the patience. **Note ** If your using high proof alcohol above 40% abv you will need to dissolve Jolly Ranchers in water first as they will not dissolve on their own. If your simply using Vodka you can get away with adding the Jolly Ranchers directly to the mason jars without dissolving them first in water. 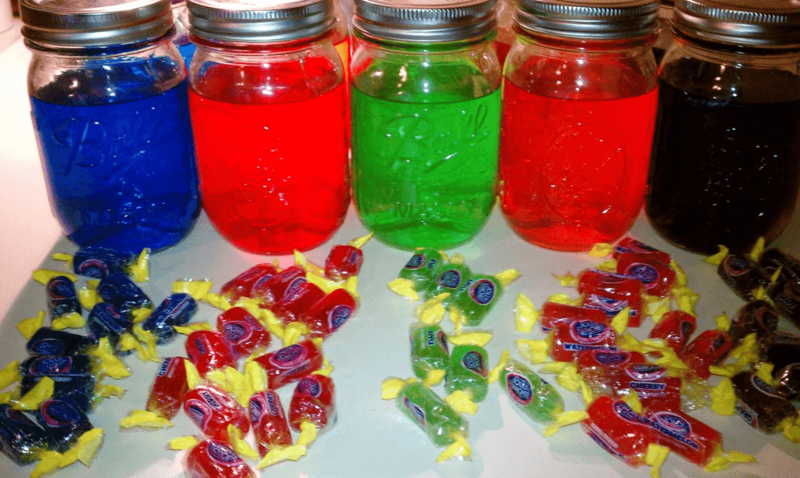 If you try this Jolly Rancher Moonshine Recipe don’t forget to let us know how it turned out by leaving a comment below. If you tweaked the recipe to make it better tell us about what you did. We’d love to hear from you. 22 Responses to "Jolly Rancher Moonshine Recipe"
Ya hot water is definitely the way to go. Keep it to a minimum though don’t wanna water down the shine to much. I used ever clear and it has been a week and the jolly ranchers still have not dissolved. Hey Kim I posted this recipe the same day I did it and my Jolly Rancher Moonshine turned out the same. I’ve looked into it further and it turns out Everclear is to strong to dissolve the Jolly Rancher candy. If you care to learn more about the chemistry check out Why does candy not dissolve in everclear? it explains the issue further. I’ve altered the recipe to dissolve the candy first in hot water and then add the Everclear. I’m trying this tomorrow I’ll let you know how it turns out! Try using jolly ranger juice i use that to do mine turns out great and i melt down 4 ranchers each o my soooo good. Butterscotch candy3(big bags) in a half of gallon of water boiled and a half gallon of shine put them on the ground. 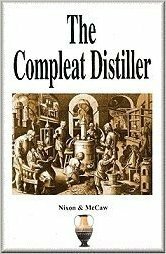 Is this the whole recipe for butterscotch shine? I don’t use water, use sprite and they melt great than add to shine, also you don’t have to add that much candy. I’ll try using sprite next time sounds like a good idea to solve the dissolving issue. My 83% jolly ranchers cinnamon taste great after a week or two man it is gooooooooddddd, my wife now loves it and that’s all she drinks over ice. To make it add 1 gal grape and 1 gal cinnamon. let it sit to infuse the tastes. How much of the syrup to you add to each jar before you put the alcohol in? 1/2 c, 1 cup??? Let us know how it turns out !